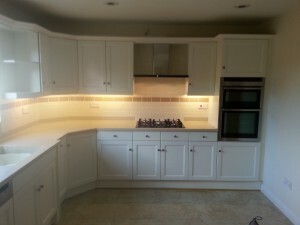 A very nice example of a Limed Oak Kitchen in Spratton, Northamptonshire that i recentley fully refurbished and Hand Painted. 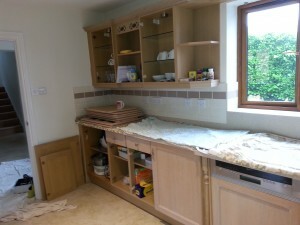 The doors and drawer fronts where solid Oak and in very good condition, The remaining areas of the kitchen cabinets where a mix of Oak cornice and plinths and laminate end panels and shelves. After being cleaned and prepared correctly, the specialist adhesion primer was applied, Followed by 2 undercoats mixed in the top coat colour Pointing, and finishing with 2 top coats in Pointing eggshell. The doors and drawer fronts where removed and completed back in my workshop in Northampton, This cuts the time down on site to around a week on the average size kitchen, most kitchens can be refurbished and Hand Painted in around two working weeks from start to completion. Firstly, Paul is a very friendly, hard working professional who has a real passion for what he does and hence, he is a perfectionist. He is flexible to fit in with customers, which is also very good. Additionally, he gave us useful advice which we are pleased we listened to. 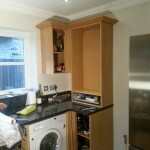 Paul has just completed an amazing transformation of our limed oak Bells kitchen. 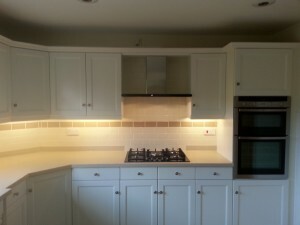 There was little wrong with the original units, apart from the colour and, as the doors were solid wood, it seemed a shame to replace everything. 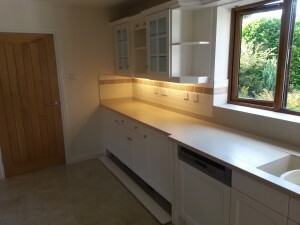 With Paul being recommended by Bells, we were expecting a high standard of work and we were not disappointed at all. The thorough preparation and the excellent paint finish have given a fantastic result. Paul’s workmanship was impressive and he took a pride in what he did, offering a high level of customer service throughout. 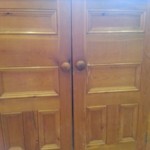 I couldn’t stop smiling when Paul refitted the doors and drawers. 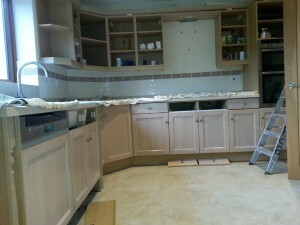 It just didn’t look like my kitchen anymore but it did look like the one I had envisaged. 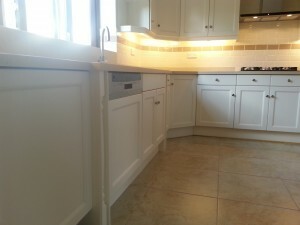 If you are considering having your kitchen hand painted I can definitely recommend Paul.